If you’re anything like me, it takes a whole bunch of food to truly fill me up. 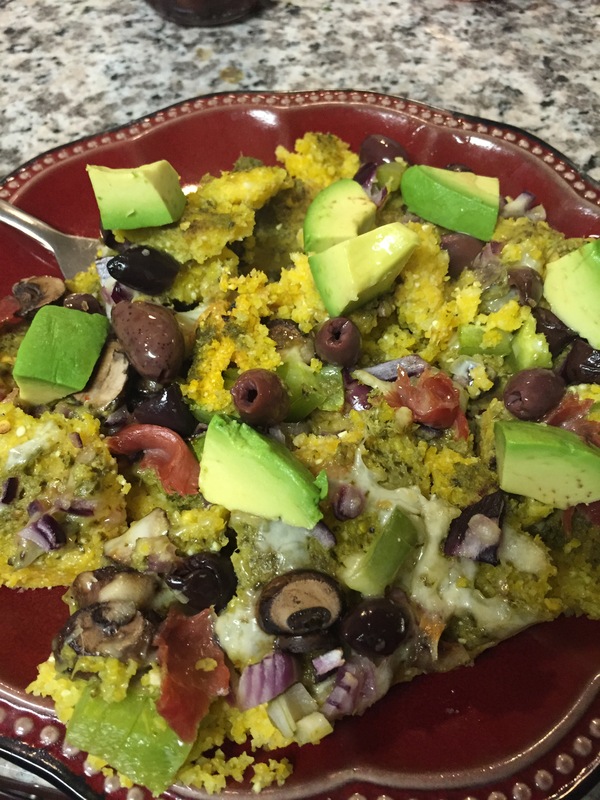 This polenta pizza is the perfect meal for those trying to satisfy their rarely satisfied stomach’s + leftovers! You can load it with as many veggies or meat as you want. It’s kinda like an art project but with tastier benefits. ;) Being gluten free, the craving for pizza is SOO real. 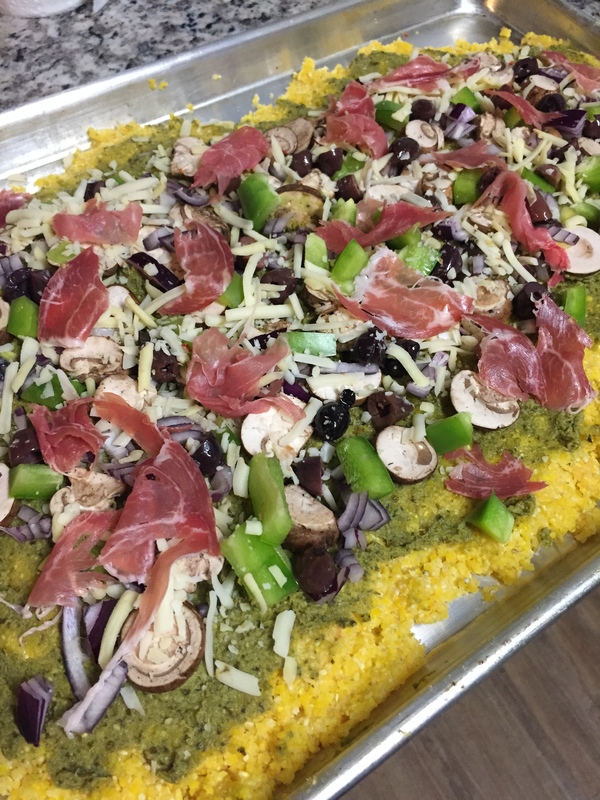 This polenta crust is so tasty, you’ll forget that you even craved pizza in the first place. (maybe) And let me just tell you, it is so so easy to make. Literally, the most challenging thing about it is boiling water (HA HA) We all know how to do that, right? 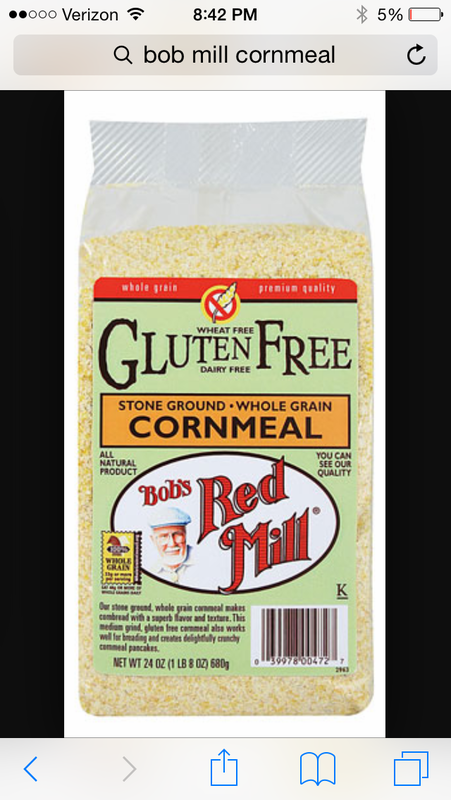 ^^^I accidentally threw away the bag of cornmeal before I could get a photo of it, but that’s the exact kind and brand that I used. Other times that I have made this recipe, I’ve used the already made polenta that comes in those weird looking tubes…and it tastes alright, but I much prefer making it myself. Start making your polenta by boiling your water and adding 1/2 cups of the cornmeal a little at a time. Continue to stir and lower the heat to allow the polenta to cook and thicken. Wait for it to obtain a sticky and thick consistency (like dough) before taking it off the heat. Spread it on a pan and begin the fun part: toppings !! Toppings, Toppings, Toppings… so many possibilities! I typically use a pesto base, but you can use whatever you want. I’ve used both a masala base and an arrabbiata base, both turned out delicious! All three sauces found at the one and only, Trader Joes :) On top of the pesto base, I used mushrooms, red onion, green bell pepper, olives, prosciutto and pepper jack cheese. Use whatever your heart desires!